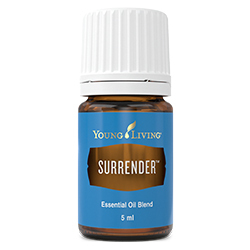 Surrender™ is a blend of Lavender, Black Spruce, Roman Chamomile, and other essential oils that provides aromas to help cast off inhibitions that may be controlling your life or limiting your potential. This comforting blend was created to help balance and calm the emotions and clear the mind. This blend may help us surrender to a more open mind. Apply to ears, throat, wrists, temples, feet, forehead, or neck to help encourage emotional balance. Use to help cast off inhibitions that may be limiting your potential or controlling your life. Wear Surrender as a perfume to help maintain calmness. Lavender (Lavandula angustifolia) oil †, Lemon (Citrus limon) peel oil †, Black spruce (Picea mariana) leaf oil †, Roman chamomile (Anthemis nobilis) flower oil †, Angelica (Angelica archangelica) root oil †, Mountain savory (Satureja montana) oil †, Matricaria (Chamomilla recutita) flower oil †.